Below you can find my analysis for the prospects ranked between 11-20 for the 2016 midseason top prospect list. If you want to see the full top 100 list, please visit the following link: SEE THE TOP 100 PROSPECT RANKINGS. I will be posting daily analysis of every player listed in the top 100, so please follow my blog and other social media for updates. Alex Reyes (STL, 21 Years Old, RHP): If you are looking for a frontline starter, look no further. Reyes has the upside of a top-10 pitcher in the next few years. He has an elite fastball-breaking ball combination and his changeup has developed quite nicely. He has been known to touch 102-103 MPH with his fastball, so that speaks for itself. He has struggled this season at Triple-A, but that doesn’t take away from his potential. In 55 innings pitched, he owns a 5.07 ERA, 51 hits against, 79 strikeouts, and 27 walks. He has an elite strikeout rate, but his walk rate does scare me. He was just scratched from his most recent start in the minors, so many people believe the Cardinals are preparing to call him up to the big leagues. Below you can find my analysis for the prospects ranked between 31-40 for the 2016 midseason top prospect list. If you want to see the full top 100 list, please visit the following link: SEE THE TOP 100 PROSPECT RANKINGS. I will be posting daily analysis of every player listed in the top 100, so please follow my blog and other social media for updates. Willy Adames (TB, 20 Years Old, SS): Adames has developed quite nicely over the last few seasons. At 20 years old, he is showing great success in Double-A. In 360 plate appearances, he is batting .264, with eight home runs, nine stolen bases, and a .365 OBP. After a slow 2015 season, Adames has rebounded very nicely after his promotion in 2016. He is starting to show more power, speed, and he is getting on base at a better rate. I don’t think he will ever be an elite fantasy baseball player, but he should be average-to-above average. Below you can find my analysis for the prospects ranked between 51-60 for the 2016 midseason top prospect list. If you want to see the full top 100 list, please visit the following link: SEE THE TOP 100 PROSPECT RANKINGS. I will be posting daily analysis of every player listed in the top 100, so please follow my blog and other social media for updates. 51. Jake Bauers (TB, 20 Years Old, 1B): Bauers has improved his game a lot in 2016. Last season, he hit .272, with 11 home runs, eight stolen bases, .342 OBP, and a .418 slugging percentage in 534 plate appearances. In only 368 plate appearances this season at Double-A, Bauers is batting .285, with 10 home runs, seven stolen bases, .373 OBP, and a .430 slugging percentage. He also has very advanced plate discipline, which should serve him well in his career. Bauers has one of the prettiest left-handed swings you will see, so it is no surprise that he is hitting so well this year. Below you can find my analysis for the prospects ranked between 71-80 for the 2016 midseason top prospect list. If you want to see the full top 100 list, please visit the following link: SEE THE TOP 100 PROSPECT RANKINGS. I will be posting daily analysis of every player listed in the top 100, so please follow my blog and other social media for updates. Kyle Lewis (SEA, 20 Years Old, OF): Kyle Lewis was drafted 11th overall by the Seattle Mariners in the 2016 MLB Draft. Lewis went to a small college named Mercer University, but nothing about Lewis is small. He puts up HUGE numbers at the plate, he is a massive human being, and he is going to be a big-time prospect. He stands 6’4 and weighs about 210 pounds. He currently plays centerfield, but as he fills out, he is expected to play one of the corner spots in the outfield. In his last season at Mercer, Lewis hit .395, with 20 home runs, 72 RBIs, and a .525 OBP. In his short time in the minors, he hasn’t been overmatched at all, which is a great sign. Lewis has immense potential and could be a serious home run threat down the line. MLB reports: The past week in Houston has seen Hunter Pence rumors flying fast and furious. Analysts pegged Pence to be headed to many destinations, ranging from Boston, Atlanta, Cleveland, Detroit, Pittsburgh and Philadelphia. As early as this morning it appeared that there was maybe a 30% chance of the Astros getting a deal done. The Phillies were seen as the favorites, having offered a package of prospects to the Astros including Jonathan Singleton and Jarred Cosart. With the Phillies offer being rejected, word had Philadelphia out of the Pence sweepstakes. With Domonic Brown apparently sought by the Astros, it was unclear if a fit existed between the teams to get a deal done. With the Braves apparently unwilling to trade any of their top pitching prospects, including Mike Minor and Julio Teheran, there appeared to be a good chance that Hunter Pence would stay in Houston as the face of the franchise. That all changed this evening and as the news continued to spread quickly, Hunter Pence as of this evening is officially a member of the Philadelphia Phillies. The cost? Jonathan Singleton, Jarred Cosart, Josh Zeid and a player to be named later. The Phillies also get $1 million from the Astros to cover salary. Along with the $1 million as mentioned, the Phillies get Hunter Pence, one of the brightest young outfielders in the game. The 28-year old Pence was a 2nd round pick of the Astros in 2004. Pence made his MLB debut in 2007 and has been a consistent performer for the Astros ever since, with exactly 25 home runs per year from 2008-2010. The right-handed outfielder finished third in NL ROY voting in 2007 and was an All-Star in 2009 and this past season. Although his home run totals are down this year, Pence has displayed some of his strongest numbers this season. Along with his .309 AVG, Pence has a .828 OPS. The Phillies in need of a right-handed bat in their lineup jumped on Pence when given the chance. The Phillies at 66-39 currently have the best record in baseball. With the Braves 5.0 GB, the Phillies could not afford to let a division crown slip through their fingers. With one of the deepest and best rotations in baseball history, Philadelphia is in win-now mode and anything less than a World Series championship will be considered a failure. With Roy Halladay, Cliff Lee, Cole Hamels and Roy Oswalt starting for the team, the Phillies definitely look and feel like a strong contender. From there, the team has its offense paced by Ryan Howard and Chase Utley. With Hunter Pence on board, the Phillies all of a sudden have a more balanced offense and become that much more dangerous. The outfield with Pence has become a little crowded, with Shane Victorino, Raul Ibanez, Domonic Brown, Ben Francisco, Ross Gload and John Mayberry. But too much talent can be a good problem to have and the Phillies have made themselves into a stronger contender by acquiring Hunter Pence. In the Phillies lineup and ballpark, the sky is the limit as far as the numbers Pence can reach. He is also under team control for two more seasons as an added bonus for a team that is trying to maintain continuity in contending for years to come in the NL East. I was calling Jonathan Singleton “Ryan Howard Jr.” during his time in the Phillies organization. Watching him play, Singleton has one of the sweetest strokes in the minors and has the potential to be a big time masher when finally getting the call to play in the bigs. 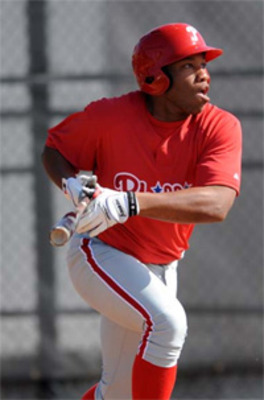 The 19-year old Singleton was an 8th round pick of the Phillies back in the 2009 draft. That is what you call great scouting. Considered one of the best, if not the best prospect bat in the Phillies organization, Singleton was drafted as a first baseman but later moved to the outfield with Howard standing in his way. With the Astros playing Brett Wallace at first, its likely Singleton’s stay in the outfield is a permanent one. Playing in high A ball this season, Singleton was showing that his game was taking time to develop. Singleton at the time of the trade was hitting .282 with an outstanding .386 OPS. While the power numbers are down, with 11 home runs and .411 SLG, it is key to remember that Singleton is young and will take time to develop as a hitter. The Phillies were very happy with him in their system and the Astros had to work diligently to get the Phillies to part with him. 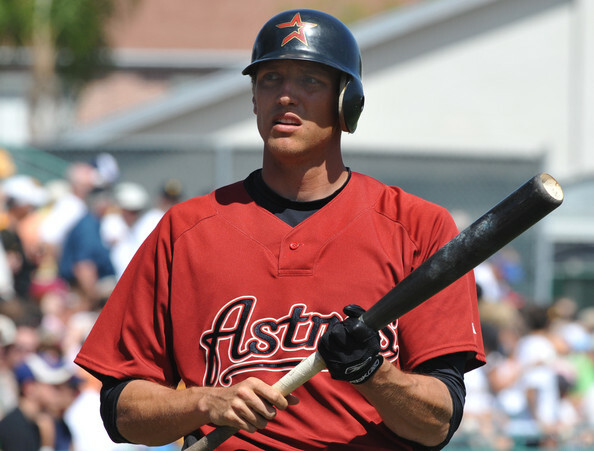 The Astros farm system instantly shot up with the acquisition of Singleton. Combined with Wallace he should pace the Astros offense for years once he gets the call one day. Jarred Cosart is a 21-year old pitcher who is also playing high A-ball in the Phillies organization. Another draft steal, Cosart was drafted all the way in the 38th round in 2008. Cosart so far in his career has pitched fairly well, with a lifetime 3.67 ERA and 1.159 WHIP. Standing 6’3″, the right-handed Cosart was highly considered as well in the Phillies organization. With the Astros sitting at 35-71, by far the worst record in baseball and new ownership coming in, the Astros had no choice but to continue to tear down their team and start over. With Hunter Pence far and away their most desired and sought after bargaining chip, the Astros had no choice but to move him and continue to stock their farm. In addition to a player to be named later, the Astros also received today Josh Zeid, a 6’5″ right-handed pitcher who has started and worked out of the pen throughout his Phillies minor league career. A 10th round pick in the 2009 draft, Zeid is again a late round gem discovered by the Phillies’ incredible scouting staff. The 24-year old Zeid excelled in his first two seasons but hit a road bump this year in AA. With a 5.65 ERA and 1.414 WHIP, Zeid had a down year in 2011 and clearly has ways to go before coming to the majors. But for a pitching staff in need of pitching depth, Zeid becomes another arm in Houston. If we go on the measure that the team with the best player wins the trade, we have to give this one to the Phillies. They received Hunter Pence, an All-Star outfielder in the prime of his career, under control for two more seasons. In return, the Phillies gave up three players that were all late round picks for the team and a player to be named later. Jonathan Singleton will be a star in my mind one day, no question. But he is still a very young player playing in the lower ranks of the minor leagues and has a long way to go before coming to the majors. That is the funny thing about prospects: their future can seem so bright, but between injuries, confidence and the ability they display by their play, it is quite often a gamble. The Astros do well in this trade if Singleton becomes a number or three or four hitter in the majors and turns into the home run hitter that he is projected to be. Cosart and Zeid are arms that may turn out to be great or average. The Astros may get two additions to their rotation one day, or perhaps just two more middle relief arms in their pen. As difficult as it is to project prospects, pitchers are the toughest of the bunch as they are more likely to face injuries and wear and tear on their arms compared to any other position players. For a team in the basement of major league baseball, the Houston Astros needed to rebuild. But to trade the last star player on their team for one solid prospect and two uncertain arms was not necessarily the route I would have taken. But this trade was as much financially driven as it was about talent. The Astros are about to be sold and the new owner already ordered a massive payroll cut. With Brett Myers and Wandy Rodriguez still on the team, the Astros most tradeable player was Hunter Pence. Considering that the Blue Jays got Colby Rasmus for three middle relief arms essentially, the Astros went young and with more upside in this trade. Personally, I think very highly of Singleton having watched him play in the past. As one of the best young hitters in the minors, the Astros got themselves likely a future superstar. But the key word is likely. For what the Astros received back in potential, they gave up in certainty. Hunter Pence is a current star player that will fit immediately in the Phillies lineup with no cost off the team’s major league or AAA rosters. Until one or more of the prospects the Phillies receive produce at the major league level, which could be years away, the winner of this trade is the Philadelphia Phillies. Our preseason pick to win the World Series just got that much stronger. The rest of baseball has taken notice and competing teams will need to beef up their rosters over the next two days if they hope to have a shot of catching the Phillies in the postseason.